A holiday classic goes gluten-free! 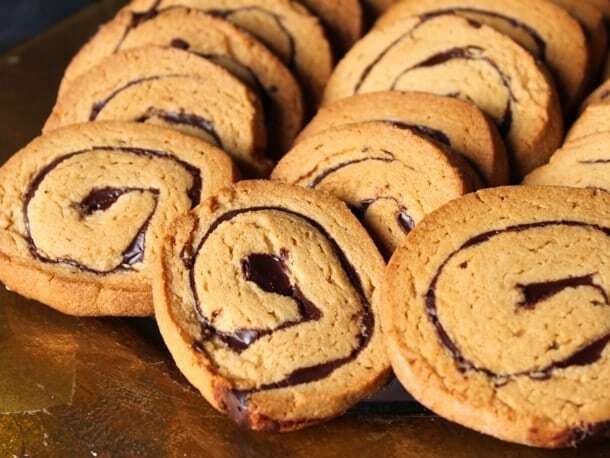 These chocolate peanut butter pinwheels look stunning and are always a welcome addition to any holiday cookie platter. The dough needs a night to chill. So be sure to make it the day before you plan to bake. 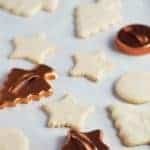 Peanut butter and chocolate go together like cookies and Santa Claus! This cookie recipe was requested by Tina. She sent along the recipe after we chatted about the holiday cookies on Facebook. I’m so glad we had that conversation! Because these cookies are seriously good. To make them, you need two pieces of parchment and a bit of patience. 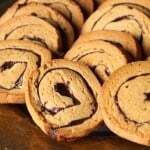 You spread warm chocolate onto cookie dough and roll it up, as Tina says, “jelly roll-style”. 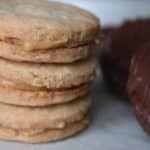 The resulting cookies are so tender that they melt on your tongue, leaving behind the earthy flavor of peanut butter with a hint of chocolate from the swirl. 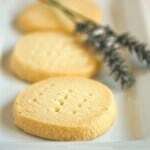 Be sure you have parchment paper on hand before making these cookies. You use it to roll the dough up into a pinwheel. Make the Dough: Whisk together white rice flour, cornstarch, sweet rice flour, baking soda, salt, and xanthan gum in a small bowl. In bowl of stand mixer fitted with paddle attachment, cream together butter and dark brown sugar until thick paste forms. Add peanut butter, cream until smooth. Stop mixer. Scrape down bottom and sides of the bowl. Add egg and vanilla extract, cream until smooth, about 30 seconds. Stop mixer. Add dry ingredients. Mix until dough forms. Generously white rice flour your countertop. Turn dough out onto counter and pat into a round. Use a knife and cut dough in half. Place one half of the dough on a piece of parchment paper. Roll into a rectangle, about 8x10-inches. Set aside. Repeat with remaining dough. (Each piece of dough should be on its own piece of parchment. Prepare the filling: Melt chocolate in microwave-safe bowl. Add butter and still until smooth. Allow to cool for two minutes. let cool completely. 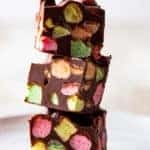 Spread each dough-rectangle with half of the chocolate mixture. Starting with the long edge, roll dough tightly, using parchment to aid the rolling, if needed, into a log. Gently press edge to seal. Roll parchment around log and then wrap with plastic wrap to seal. With sharp knife, cut 1/4-inch slices. Place slices 1 1/2 inches apart on baking sheet. Bake until golden brown, about 10 minutes. Allow cookies to cool on baking sheet for five minutes before transferring to a wire rack and cool.